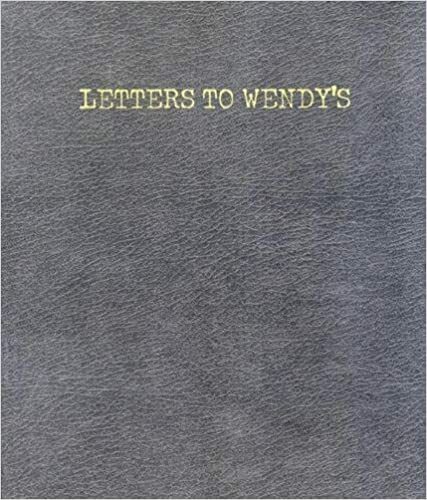 Letters to Wendy’s – loudlatinlaughing – Euge! Euge! Oct 7, 1996: Why is there somewhere that is not Wendy’s? The question haunts me. Perhaps there need be a coming into Wendy’s, a coming into that’s only possible when there is a no-Wendy’s. Perhaps the question should be: is there truly somewhere that is not Wendy’s? Could our conception of where we are have developed within an unconscious need to forget how far Wendy’s truly extends? Nov 16, 1996: It’s good, this not knowing anyone’s name. The employees have name-tags, but no one believes them. Their anonymity is far too obvious. How monstrous to introduce oneself to one’s register person! How useless, how wearying, that information is! Only the shouted names of children make sense here, denoting not a person but a drifting off, a subversive fascination. Dec 3, 1996: Today I had fifteen dollars worth of coffees. I got them one at a time, and dined in. The first five were leisurely, but then the leisure disintegrated. I went through the last five in about five minutes. After awhile the register girl looked at her manager as if to say: “Is there something we should do?” The manager said nothing. I said nothing. We understood one another perfectly. Apr 8, 1997: Sometimes I think of Wendy’s as a library without books. Without records, magazines, maps, or videos. Without a rare books room, and without an Information desk. As such, it is the most pleasant library I’ve ever visited. It offers one text—on reserve and on view. This text explicitly organizes the way we feed ourselves. And it allows us to act as though a greater significance has never been attempted.